Looking for family-friendly restaurants in Redmond, WA? 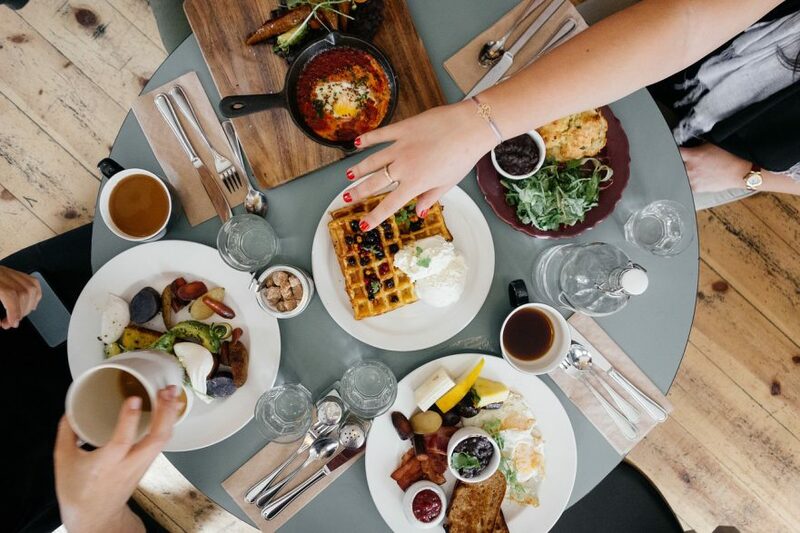 We love eating out with our little one but there are so many dining choices in the Redmond area that we get decision fatigue before we find a place on Yelp. When that happens, we refer to this list to help us decide where to eat out. Must provide highchairs or booster seats (eating with the kid in our lap is no fun for anybody). No formal dining places or romantic spots (we don’t want to ruin anyone’s special date night or anniversary celebration when our kid misbehaves). Must have some non-spicy food items (our kid thinks BBQ sauce is spicy!). Serves moderately healthy food (we are not looking for organic vegan stuff; but a few bits of vegetable would make us feel better about our parenting abilities). In other words, we are looking for restaurants that are casual, not exclusively for couples, and serve more than beer and fried food. Is there a more family-friendly restaurant in Redmond, WA? We love the traditional American breakfast items and the kid-friendly atmosphere (crayons and coloring sheets). And who doesn’t love that giant teddy bear by the door? Plus they open at 5.30am every day! So the next time your kid wakes you up at some ungodly hour, just head out to Family Pancake House and grab some pancakes. Cons: the wait can be long, especially on the weekends; also the coffee is meh. This is our pick for Sushi a Toddler Will Eat. This, being conveyor belt sushi, is not fancy “authentic” sushi, so adjust your expectations accordingly. But it is good for what it is: a casual neighborhood joint with sushi that is acceptable to a two-year-old’s palate, with enough choices to please Mom and Dad. Plus the dishes moving by on the belt is downright mesmerizing to kids. If you look at the online reviews, you’ll see that people either hate it or love it. Interestingly, despite the so-so reviews, this place always seems to have lines out the door. My recommendation is to keep an open mind and give it a try. Preferably not during the weekend dinner rush. Cons: long lines during the weekend lunch and dinner rush. Excellent pizza, plenty of healthy choices and a play kitchen at the seating area! This is where Mom and Dad can eat in peace first while Junior has fun exploring the play kitchen. Best of all, you can shop for groceries when you are done. Ok, this doesn’t get my vote of the best pizza in Redmond (that goes to Pagliacci’s) but Mod Pizza is awesome when your kid is whining to eat right now. Lots of kid-friendly options as well. Cons: crust is thin and floppy. If you need your burger fix, don’t forget to check out Tipsy Cow, arguably the best burger joint in Redmond. It’s a tad pricy for burgers but beat’s Feed Co.’s burgers hands down. Parents will appreciate the high quality ingredients and non-traditional burger toppings. Kids will love the excellent fries and milkshakes. Cons: this place is ALWAYS packed; this much animal fat gives me heart-burn! I can only recommend this for breakfast and brunch because that’s what I’ve tried and what I’ve seen tells me that it’s a well-run restaurant with high quality food. It’s New American cuisine so the portions are lighter and smaller, and pricier. Still, the food was beautifully presented, with plenty of choices for my picky toddler. And we didn’t feel out of place with a noisy kid. This food court is like nothing I’ve encountered in the U.S.! Forget your usual boring food court pizza and fast food. This place has a bit of everything! Which is great for families because everyone can pick what they want to eat. There’s Indian, Thai, Hawaiian, Vietnamese, Chinese, Japanese, Mexican, Greek, American, Russian and French food! We like the Thai food (great Pad See Ew) and the Vietnamese food (good pho). The piroshky is tasty and rich. Well worth the extra calories. After your meal, go explore the mall. My kid loves checking out the giant chess set. We love Thai food but most of the time, my toddler has trouble eating it because it’s so spicy. We were pleasantly surprised to find that Sukho Thai’s lunch buffet (Monday to Saturday only) has lots of non-spicy options that my kid could eat. It’s vegetarian and although it’s a tad sweet for Thai food, the flavors are appealing to my kid and she ends up eating tons of vegetables here. It’s a bit grungy (neon colors; TV in the corner; worn booth seating) but the food is fresh and made to order, and so so good! Dining here with my kid is completely stress-free because the food comes out fast, there’s always plenty of seating and the servers are super nice to kids. Did I miss any family-friendly restaurants in Redmond, WA that you think should be on the list? Let me know below or send me an email.